IS MYSTERIOUS BEAST THE SAME AS ONE SEEN IN DONEGAL? WHEN shocked eyewitnesses claimed to have seen a panther-like beast outside Letterkenny three years ago, most people thought they were bonkers. 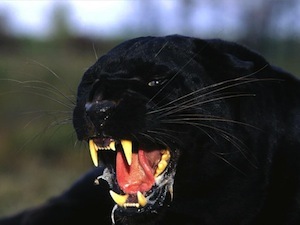 A large beast – also thought to be a black panther – is said to be on the loose near Kilkenny town. ‘The beast of Listrolin’ is frightening the wits out of locals there. Local hunter Ned Egan, told The Star today: “I had a good view. The animal appeared, running like the wind. Sightings of similar panther-like animals were also reported in Kilsheelan, Tipperary in 2008 as well as Letterkenny three years ago.